For an introduction to the basic API of the SUMMON module, let us walk through the code of the first example. This example is included in the source code (download) under the summon/examples directory. To begin, change into the summon/examples/ directory and open up 01_basics.py in a text editor. Also execute the example with following command. 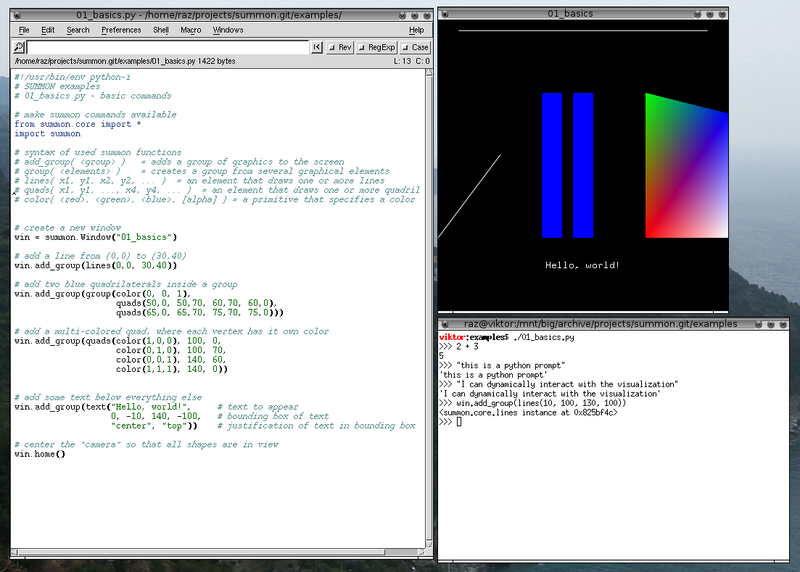 The following visualization should immediately appear in a new OpenGL window. The following mouse and key-bindings are provided by default in SUMMON. You can use them to navigate your visualization. They can be customized with the set_binding function. In your text editor, the example 01_basics.py should contain python code similar to the code displayed below. The first two lines of the script import the summon module and all of the basic SUMMON functions (group, lines, color, etc) from the summon.core module into the current environment. A note about python-i: The first line of any script specifies the program to execute the script. Typically this is #!/usr/bin/python for Python scripts (this line only has significance on Unix-like systems). However, your Python interpreter may not be installed in this location, or the version of Python you wish to use is installed elsewhere. To accommodate this situation, developers often write the first line as #!/usr/bin/env python in order to run the program env to lookup the python interpreter from the user's PATH environment variable. In our examples, we will also like to use the Python -i flag to enter interactive mode. However, the first line of scripts typically only allow one argument. python-i is a wrapper script installed with SUMMON to work around this restriction. See python-i for more. A new SUMMON graphics window is created using the summon.Window class. The title of the of the new window will be "01_basics" and it will immediately open. The win object will allow us add and remove graphics to and from the window. All graphics are added and removed from the window in sets called groups. Groups provide a way to organize graphical elements into a hierarchy. The first graphical group added to the window is a line. The line is created with the lines function, which takes a series of numbers specifying the end-point coordinates for the line. The first two numbers specify the x and y coordinates of one end-point (0,0) and the last two specify the other end-point (30,40). Next, the line is added to the window using the window's add_group function. The next part of the example adds two quadrilaterals to the window with the quads and group commands. The arguments to the quads function are similar to the lines function, except four vertices (8 numbers) are specified. In the example, two quadrilaterals are created and grouped together with the group function, which takes an arbitrary number of drawing elements as arguments. Note, both the lines and quads functions can draw multiple lines and quadrilaterals (hence their plural names) by supplying more coordinates as arguments. The third group illustrates the use of color. Color is stateful, as in OpenGL, and all vertices that appear after a color object in a group will be affected. The color function creates a color object, which can appear within graphical elements such as lines and quads or directly inside a group (see the previous code snippet for an example). Since each vertex in the quad above has a different color specified before it, OpenGL will draw a quadrilateral that blends these four colors. Lastly, an example of text is shown. Once again, the text is added to the window using the window's add_group function. The arguments to the text function specify the text to be displayed ("Hello, world! "), a bounding box specified by two opposite vertices (e.g. the lower left (0,-10) and upper right corners (140,-100)), and then zero or more justifications ("left", "right", "center", "top", "bottom", "middle") that will affect how the text aligns within its bounding box. There are currently three types of text: text (bitmap), text_scale (stroke), and text_clip (stroked text that clips). The bitmap text will clip if it cannot fit within its bounding box. This is very useful in cases where the user zooms out very far and no more space is available for the text to fit. See the example 10_text.py for a better illustration of the different text constructs. The final function in the script is win.home(), which causes the SUMMON window to scroll and zoom such that all graphics are visible. This is a very useful command for making sure that what you have drawn is visible in the window. The command can also be executed by pressing the 'h' key within a SUMMON window. This key comes in handy when you "lose sight" of the visualization. See the remaining scripts in the summon/examples/ for examples of SUMMON's more powerful features. For more documentation, also see the manual and online API documentation. In the next tutorial, we will learn how to use functions and transforms to create more complex visualizations.